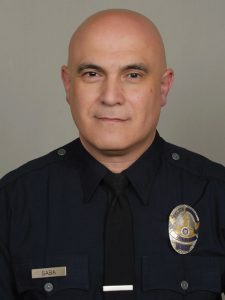 Reserve Police Officer Joseph Saba, West Los Angeles Area, is the Reserve Officer of the Year for Operations–West Bureau. Reserve Officer Saba has been a Level I reserve officer with the Los Angeles Police Department for the past 20 years. He joined the Department in December 1997 and has worked his entire reserve career in the West Los Angeles area. Saba’s duties include attending monthly WLA Reserve Officer meetings, backfilling for patrol, answering radio calls for service, enforcing vehicle code violations and effecting arrests. Additionally, Reserve Officer Saba has assisted WLA by working alongside senior lead officers at community events. The Department proudly honors Joseph Saba as the 2017 Reserve Officer of the Year for West Bureau. Reserve Police Officer Roger Andrews, Mission Area, is the Reserve Officer of the Year for Operations–Valley Bureau. Reserve Officer Andrews, a Level I reserve officer, has completed 22 years as a reserve officer with the Los Angeles Police Department. He was born and raised in the Mission area. Reserve Officer Andrews has distinguished himself as a dedicated officer who has devoted many hours to assisting the citizens of Los Angeles. He is always willing to lend a helping hand and volunteer for any special detail that may arise. Roger has earned the respect and admiration from both his peers and supervisors. Reserve Officer Andrews continues to make sacrifices in his personal life to serve the needs of the Department and the citizens it serves. His performance surpasses that which is required of a reserve officer. Roger’s passion for working with our youth programs distinguishes him from others. During the holidays, Roger devoted many hours at the children’s hospital, assisting in the oncology ward, in addition to sending care packages to our military personnel, to thank them for keeping our country safe. The Mission Area Command Staff feels it is an absolute honor to have Reserve Officer Andrews assigned to their division. The Department proudly honors Roger Andrews as the 2017 Reserve Officer of the Year for Valley Bureau. Reserve Police Officer Kenji Inaba, Rampart Area, is the Reserve Officer of the Year for Central Bureau. 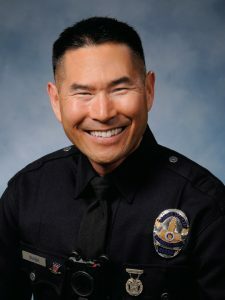 Reserve Officer Inaba has been a Level I reserve officer with the Los Angeles Police Department for the past two years. Dr. Inaba is a full-time trauma surgeon on the teaching faculty at USC, where he serves as the vice chair of the Department of Surgery, the medical director of the Surgical Intensive Care Unit and the director of the Surgical Training Program. The reserve officer program has allowed Dr. Inaba to use his medical expertise to help the LAPD. After completing the Academy, Reserve Officer Inaba was assigned to Rampart Area, where he worked the field as a probationary reserve officer. After successfully completing his probation, he remained at Rampart on day watch. Reserve Officer Inaba is dedicated to serving the LAPD and making a difference in the community; he has logged 427 hours of patrol time. Dr. Inaba has also made major contributions to the care of our critically injured officers, making himself available 24 hours a day, 7 days a week, to assist in the care of any officer injured on or off duty. At USCMC, he was instrumental in creating a High Visibility First Responder patient program designed to provide expedited high-level care for injured first responders. Recently, after one of our own Rampart officers was shot during an ambush, Reserve Officer Inaba received the call while he was in Canada. 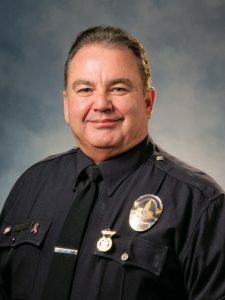 He immediately flew back to Los Angeles and coordinated the care of the officer, who is now recovering and expected to return to work in full capacity as a patrol officer. Dr. Inaba’s continued presence and dedication to the Department will ensure that all of our officers receive the highest standard of medical care no matter when or where they are injured. The Department proudly honors Kenji Inaba as the 2017 Reserve Officer of the Year for Central Bureau. Reserve Police Officer Sharon Abbott, Harbor Area, is the Reserve Officer of the Year for Operations–South Bureau. Reserve Officer Abbott has been a member of the Los Angeles Police Department family for 48 years. Sharon developed an interest in the LAPD at a young age because of her father, who helped create a counterintelligence program for the Department in the 1960s. He often shared LAPD stories with her and took her to LAPD sites, exposing her to LAPD culture. Sharon knew that one day she would become an LAPD officer. 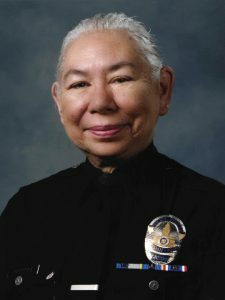 Sharon was part of the third LAPD Explorer class in 1970, after the Department allowed women to join, and she was the first female explorer to achieve the rank of captain. After high school, Reserve Officer Abbott attended the University of Honolulu, Hawaii, where she became a liaison between the university and the LAPD Explorer program, educating Pacific Islanders about the Explorer program and, in turn, educating the LAPD about Pacific Islander culture. Upon graduating college, she returned to the LAPD Explorer program as an adviser. Reserve Officer Abbott continued to provide leadership and growth to the Explorer program. Because of her devotion, Sharon was awarded the Silver Beaver Award, the highest honor from the Boy Scouts of America. In May 1990, Sharon’s dream came true when she completed the LAPD reserve program and donned the LAPD uniform for the first time. As a reserve officer, Sharon worked Southeast Division, Training Division, Fugitive Warrants Section, Youth Programs Unit, Operations–South Bureau and Harbor Division, all while maintaining a 40-hour workweek in her civilian life. The Department proudly honors Sharon Abbott as the 2017 Reserve Officer of the Year for South Bureau.